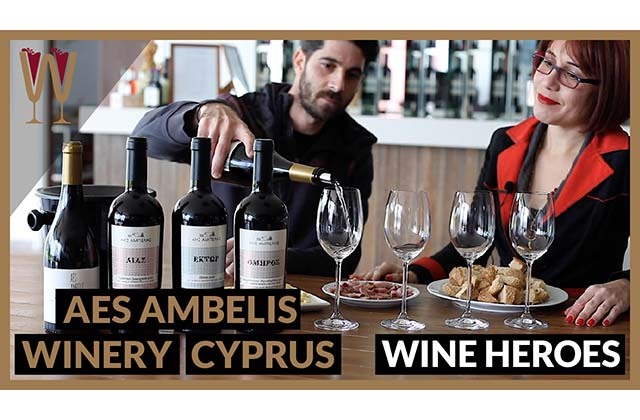 WineScribble is invited to visit Aes Ambelis Winery in the mountainous Nicosia district of Cyprus to taste the new range of premium wines. Find out about the tasting profiles of ‘Fume’ Sauvignon Blanc, ‘Ektor’ Shiraz, ‘Aias’ Cabernet Sauvignon and ‘Omiros’ Maratheftiko. Also, enjoy the discussion of wine and food pairing between WineScribble and Kyriacos the winemaker at the Aes Ambelis Winery. Hey Tasters! Contrary to popular belief sometimes it does rain in Cyprus. Today I’m in Aes Ambelis winery in the mountainous district of Nicosia. And I have come here to taste the premium range of their wines. Kyriacos, shall we start by tasting the Sauvignon Blanc? Yes, now let’s try the Sauvignon Blanc. As we know, Sauvignon Blanc is a white variety, with plenty of acid. But, most Sauvignon Blancs on the market are fresh, aromatic and fruity. We decided to make a change in our Sauvignon Blanc So it is fermented and subsequently aged in wooden barrels for 6 months, approximately. So we expect a smokey character, which is why we call it ‘Fume’. I see. So, the Sauvignon Blanc passes through oak barrels, becomes rounded and acquires aromas? Yes, it is enriched with some additional aromas. Yes body, but also aromas from wood such as vanilla and smoke. Very tasty, the smoke. So, what would you pair this wine with? If we went with meat, chargrilled chicken would be best, or even chicken with a white sauce. White sauce with cream? With Mushrooms? Likewise, pasta with white sauce, and since it has plenty of acidity we can also combine it with fired seafood such as calamari, and other seafood such as salmon or prawns. Yes, prawns. It is very good. A prawn salad, perfect. So is this a new label design? I don’t think I have seen it around. Yes, yes, it is new. The particular bottle we have tasted is from 2017. It first came out in 2016. So this is a new wine and a new label? Yes, yes it is new. What’s next? So, let’s talk about our red wine premium range. Which are mono-varietals. The first wine we will try is 100% Cabernet Sauvignon. And later we will try the Shiraz and Maratheftiko. Respectively, their names are Aias, Ektor and Omiros. Recently we have made some changes in the labels and in the bottles. Yes, I can see the shape of the bottle is completely different and the design of the label. Very modern, very contemporary. Compared to the old labels, we think that they will be easy to find on the shelves. If you like, we could compare one of the old labels. I remember that your bottles always used to have this style of label. Yes, that particular label is the Maratheftiko. Beautiful. And the replaced label design for Omiros is here. Okay, so let’s start with Cabernet Sauvignon, a variety we all know. This is one of the red varieties that has acidity. With tannins? Yes, there are plenty of tannins and peppery, spicy aromas. With the primary characteristic of Cabernet being white pepper, or some mint. Okay, so let’s try it. A very rich aroma. These specific mono-varietal wines age in oak barrels. French oak barrel for 14 long months. 14 months in the barrel? All three of them? Yes, each one separately. The colour is marvellous. It is a very very deep colour. Yes, the colour is a rich ruby red. The colour of a king’s robe. And the aromas are all red fruit. And aromas of mint and eucalyptus dominate. Yes. It is very rich on the palette. Yes, it is a wine that wants to be paired with meaty foods. It has body and tannins. With meat, yes, fatty meat. Red fatty meat. For example, something Cypriot, we could pair it with Kleftiko roast lamb. Kleftiko roast lamb, what a great idea! It is a spicy meat cooked in the oven for hours. It gets soft but stays rich and fatty, spicy lamb, perfect! Okay, so now we get to the Shiraz, named Ektor. Again, we are all familiar with this international variety. The difference between this and Cabernet is in relation to its aromas. In Shiraz, sweeter aromas dominate. Which are reminiscent of chocolate, but there are also spicy aromas due to ageing in barrels. Shiraz is one of my favourite varieties because I love spicy food. I always find that if I pair it with steak, I always prefer pepper sauce. It doesn’t have the high acidity of a Cabernet Yes, this one I could drink on its own without food if I wanted to more easily. Or even with some cheeses. What cheese would you pair this with? With peppery hard cheese such as parmesan. Peppery cheese, yes. Asiago perhaps, or even a mature cheddar. Okay, so let’s look at Maratheftiko, a local Cypriot variety. In other regions you may have heard this Maratheftiko wine variety referred to as Vamvakada, for example in the Pitsilia region. This particular bottle of Maratheftiko that we make comes from select vineyards, single vineyards, from the district of Paphos, where the grapes are controlled and selected. Now in comparison to the Cabernet and the Shiraz, the Maratheftiko is somewhere in this middle. It is different to both. It combines both characters, it combines the acidity of Cabernet, along with its peppery aromas, but also the spices and sweet aromas of Shiraz. And the vineyards in Paphos, they are? They are relatively old, maybe 20 or 25 years old. That’s quite old for vines. The age certainly has an impact on the productivity of the vines. And the fewer the grapes the vine produces, the richer the wine! I think this is my favourite of the three premium red wines. It is indeed fruity and rich, but with calmer tannins. So we can pair it with a rich red chargrilled steak. Also, with beef, roast beef or fillet steak And lamb chops, which are my weakness, cooked over charcoals. And the colour, it is rich, like a deeply hued ruby. Hey Tasters! I have had as much fun editing this video as I did visiting the winery. Aes Ambelis is a lovely winery, amazing wines, great people. Guys, if you have enjoyed the video give me a thumbs up, make sure you share the video with a friend. If you have any comments about any of these wines, or if you have a favourite red wine, please, let us know in the comment section below. If you haven’t already, please subscribe. And, I’ll see you in the next video.